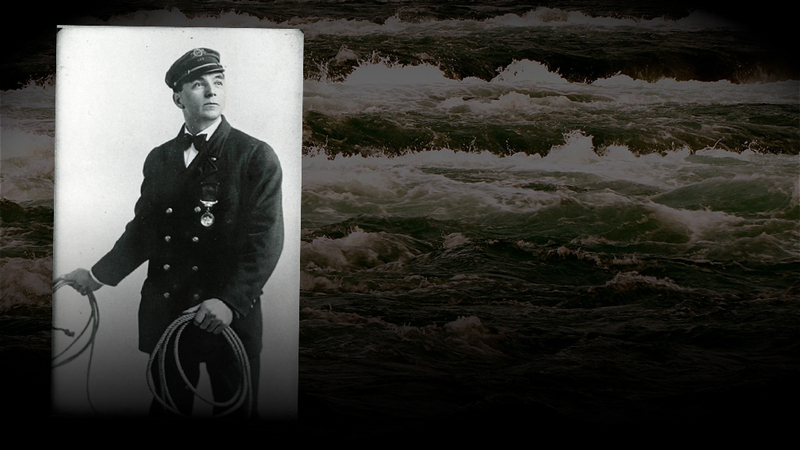 In 1893, Surfman Ingar Olsen of the U.S. Life-Saving Service in Milwaukee performed one of the most daring rescues in Lake Michigan history. Ingar Olsen, a 22-year-old surfman with the Milwaukee station of the U.S. Life-Saving Service, was never able to explain his actions on April 20, 1893. With near-hurricane winds whipping a bitterly cold Lake Michigan into towering, violently churning waves, Olsen’s crew struggled through the storm in an open rowboat to reach a lone man, unconscious, near death, and clinging to wreckage 3,000 feet off Bradford Beach. Against incredible odds, Olsen was about to make one of the most dramatic rescues in Lake Michigan history. Digging the water intake tunnel deep under Lake Michigan in 1891. Courtesy Milwaukee County Historical Society. Twenty years before, in 1873, Milwaukee took a major step to improve public health. The city’s new waterworks pumped relatively clean water from Lake Michigan to a reservoir at North Avenue. From there, the water was then sent to consumers just as it was – untreated and unfiltered. (It was not uncommon to turn on a tap and have a tiny fish fall into the sink.) Still, it was still much healthier than the prior practices of using shallow residential wells, often dug next to cess pits, or drawing water from the heavily polluted Milwaukee River. In the early 1890s, the city started work on an extension to the Lake Michigan intake. Workers began by building a small island – called a “crib” – 3,000 feet off Bradford Beach. Built of timber pilings and large rocks, the crib was octagonal in shape and 100 yards in diameter. From this manmade island, workers dug a shaft 140 feet down and then started to drive a tunnel to shore that would eventually house two 60-inch intake pipes. 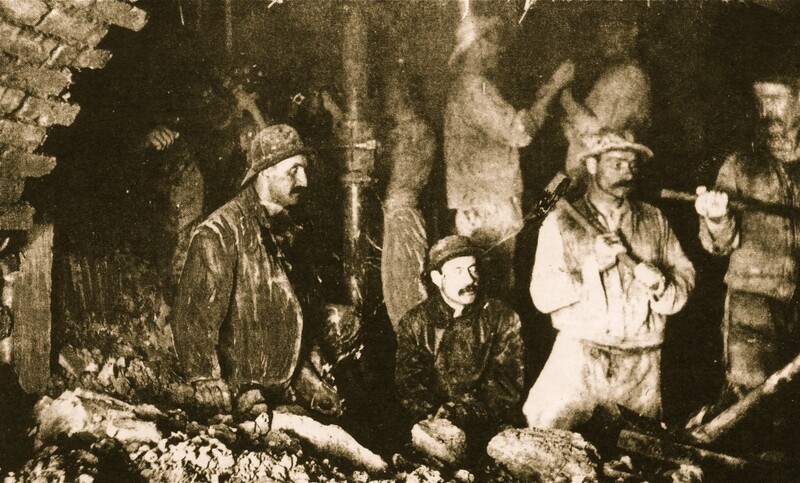 While the work progressed, the engineers, miners, and bricklayers lived in a large timber structure on top of the crib, which also housed the tools, compressors, and other necessary machinery. Wary of Lake Michigan storms, the contractor made the shelter walls of 12-inch-thick timbers. It was a substantial building, but it was no match for the intense storm that struck Milwaukee on the night of April 20, 1893. At dawn, onlookers gathered at the lakefront could see the crib shelter had been swept away by the storm. A splintered platform around the iron shaft was all that remained. While there was concern over the fate of the 15 workers on the crib, there was also the reassuring knowledge they likely had taken shelter behind the watertight doors of the tunnel. In fact, the workers evacuated the timber house at 10 p.m. the previous night. Huddled in the tunnel, they spent a dry and relatively comfortable night. When morning came, they realized the air supply compressor, located in the crib building, had failed, water had filled the access shaft, and the air in the tunnel was rapidly giving out. Then one of the workers died. Moments later a second died. Someone struck a match and looked at his watch. It was 7 in the morning. Rather than suffocate in the tunnel, they decided to open the airlock door to the flooded shaft and attempt to fight their way to the surface. Water roared in as the men struggled to escape the tunnel. Six made it to the surface. Onlookers from shore – some of them the workers’ own wives and children – could see the men clinging to the wrecked platform, constantly battered by massive waves. As they watched, one by one the workers were swept to their deaths in the churning waves. One question was on everyone’s mind – where was the life-saving service? 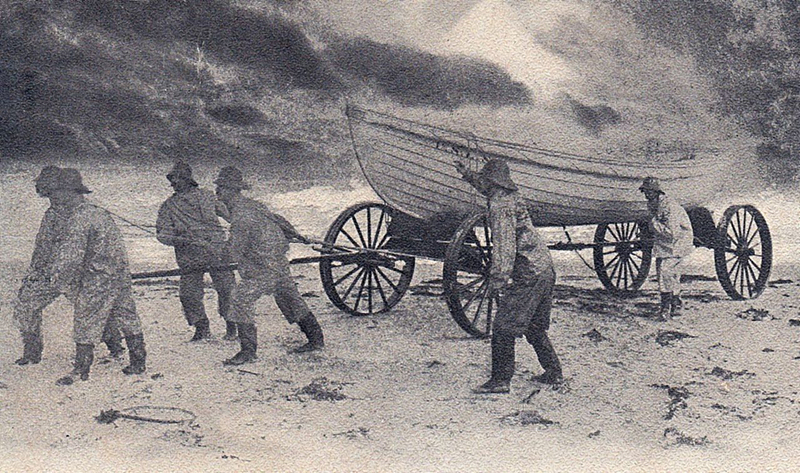 A postcard from 1906 shows the surf boat and wagon used by the U.S. Life-Saving Service. 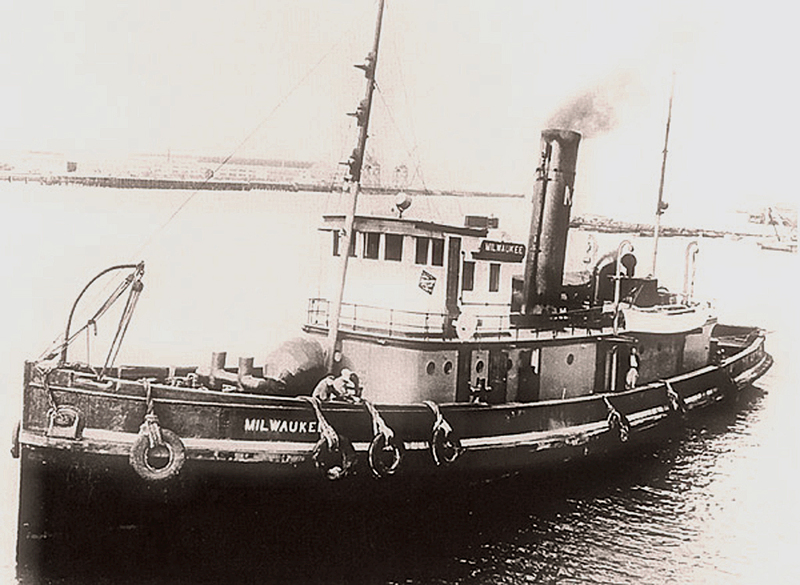 Ingar Olsen and the other men of the Milwaukee Station of the U.S. Life-Saving Service had been out all night rescuing the crew of a schooner blown aground. Exhausted, soaked to the skin, and half frozen, the surf men had just returned to their station when a man on horseback galloped up shouting that the crib had been swept away. They immediately set out for Bradford Beach, rolling their surf boat through the city streets on a wagon. However, an axle broke on the wagon as they reached South Water Street. The leader of the life-saving service rushed to the nearby tugboat office, where Capt. Bill Gnewuch of the tugboat Welcome agreed, at great risk to himself and his crew, to tow the surf boat through the storm to the wrecked crib. The captain of the tugboat Welcome risked his life and the lives of his crew to assist in a rescue in the midst of a violent Lake Michigan storm. As the surf men struggled to get to the platform, they could see two survivors. A moment later, one of them was swept away to his death. Olsen waited no longer. He dived into the surging waves and swam through the ice-cold water to a piling. 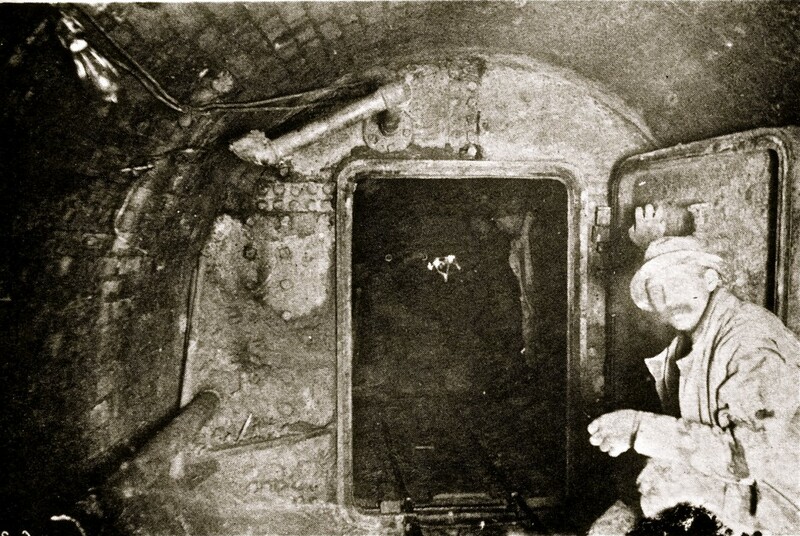 From there, Olsen cautiously picked his way through the waves and wreckage to reach the remaining survivor, who he later learned was James Miller, the foreman of the tunnel workers. A giant of a man, over six feet tall and weighing 235 pounds, Miller was unconscious – but a cable wound around an arm had prevented him from being swept away. The crew then threw a rope to Olsen. He had been on the crib for two hours and barely had strength to make it back to the surf boat. Olsen later said he could remember nothing of the trip back to shore. Olsen earned a gold medal for his actions on the morning of April 20, 1893. He would stay with the Life-Saving Service, later part of the U.S. Coast Guard, and would retire as the Milwaukee station commander. Miller, the man Olsen rescued, made a full recovery, and a new job took him out-of-town. The two met years later to reminisce about the horror, and heroism, of that day. Part of Olsen’s written commendation. Courtesy U.S. Coast Guard. I was truly riveted by this amazing and exciting story! What a courageous act. Wow, what a great and moving story. I appreciate the effort finding the accompanying photos. Thanks for sharing these heroic deeds, Carl! Just to let you know, the name of the tug Welcome’s Captain (my ancestor, which is how I know) was William Gnewuch, not Bill Yunevich. He was also the son of a Gold Medal awarded (1881) captain, Charles Gnewuch of Manistee, MI, so helping out with this kind of thing ran in his family. Wow! Like father, like son! Thanks for pointing out the spelling error — I’ve changed it in the text. I’m trying to find the names of the men who died. One of my ancestors died in Lake Michigan on this exact date, but he was Captain Burton, and not connected with the water works, as far as I know.